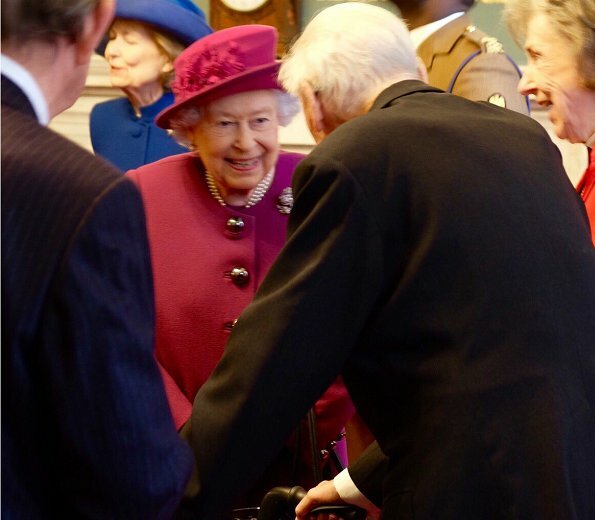 Queen Elizabeth II of Britain and King Harald V of Norway attended the Anglo-Norse Society centenary reception at the Naval and Military Club in London. The Centenary Reception offers an opportunity to recognise members of the Anglo-Norse Society who have made a positive contribution to its community and culture over the past 100 years. 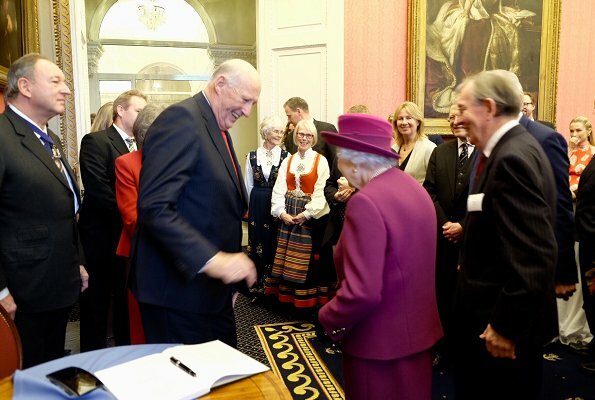 Queen Elizabeth II and King Harald V are joint Patrons of the Anglo-Norse Society. 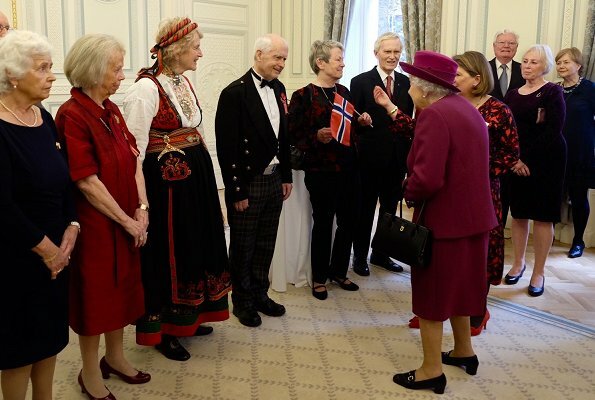 The Society is a registered charity for the purpose of advancing the education of the citizens of Britain and Norway about each other's country and way of life. You look at her and you instantly have a smile on your face. No other leader in the world radiates positivity and commands respect as much as her. Two very respected and beloved senior Royals. They are closely related as well, and the families have strong ties with each other. 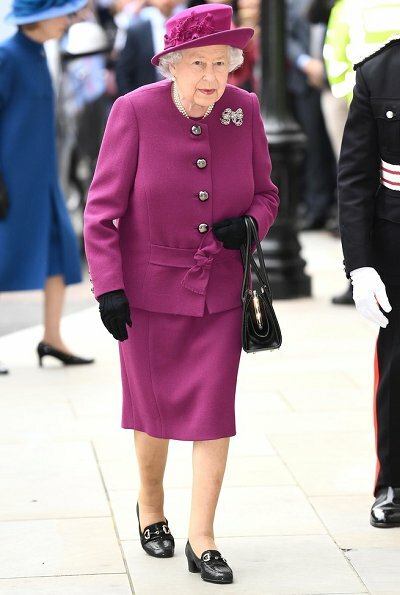 The Queen's outfit and colour is lovely. They are 2nd cousins, I would not call that 'closely' related. Yes. Queen Elizabeth's grandfather George V, and King Haralds grandmother Maud Queen of Norway were brother and sister. 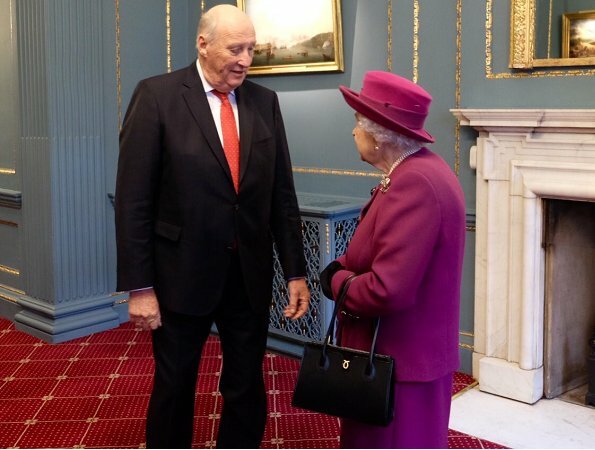 Gabriella His Majesty the King of Norway met Norwegian press following the visit where he commented on his second cousin, Queen Elizabeth. 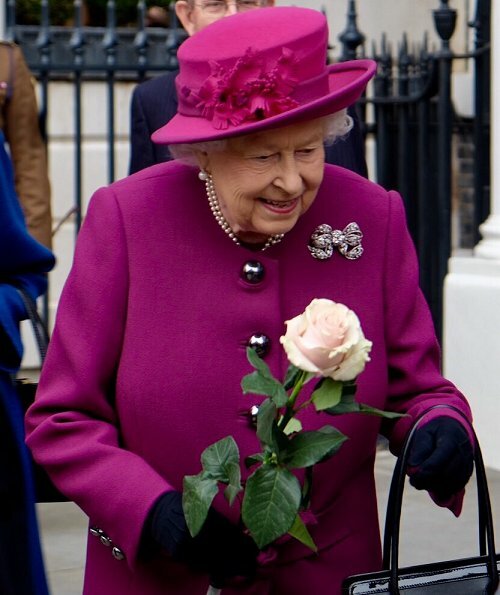 His Majesty said: “She is in great shape. 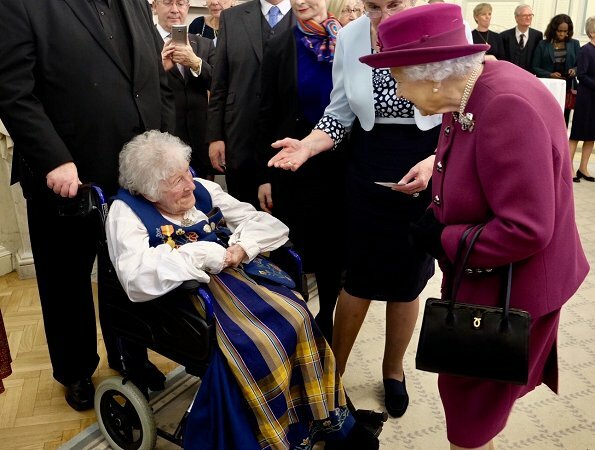 It is completely incredible to more than 90-years-old. It is always very nice and to meet her. We talked about everything possible. We are a family”. Harald and Sonja are close friends with Charles and Camilla, and so are MM and Haakon with Sophie and Edward. 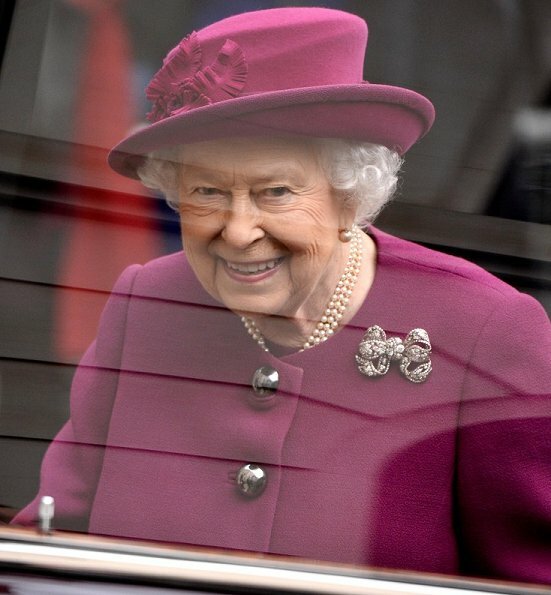 The Queen have even photos of them in her living room as we have seen several times. It's impertinent what we think about if they are close related or not. They feel like family. I agree to all of it. Die beiden sind einfach zauberhaft. Two charismatic leaders who have been respectfully serving their country. 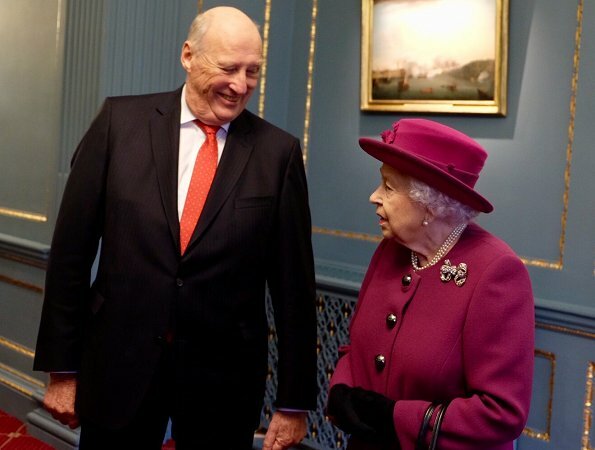 QE sometimes seems a bit distant, even frightening, but the king of Norway is always warm and humorous. Wish we had a love button for posts. I agree! I think that every one likes Harald who is such a gentleman and the Royal nr.1 Queen Elisabeth are the most respectful Lady in the world.I wish I could be there to see them. Well, she is just a charming lady. So very, very young for her age! I believe we can all learn from her - what a commitment and such a joy she brings in everything she does and everywhere she goes. This suit and the colour are amazin, they fit her so well! Honestly, this is her best look in years (in my opinion). King Harald looks very "regal" of course, I understand he is highly respected. They have a good chemistry together - no surprise here. May they both live long and happy. Wow, she looks absolutely amazing. And I love her outfit: beautiful colour, slimming cut, and the low belt with the bow knot gives it a certain sprightliness. 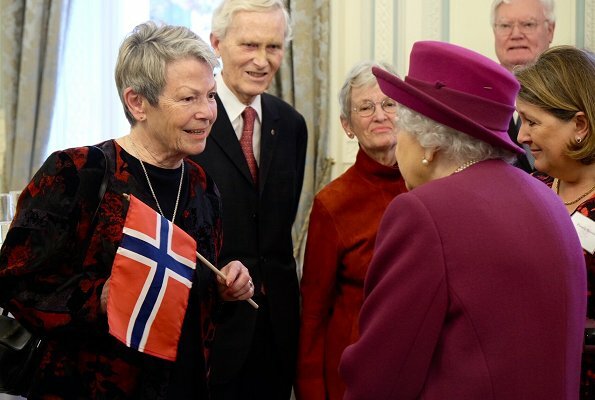 Queen of the UK and King Of Norway two Pro's at work , lovely to see them together. Love the magenta suit she has a wonderful smile. Lovely jewelry too. 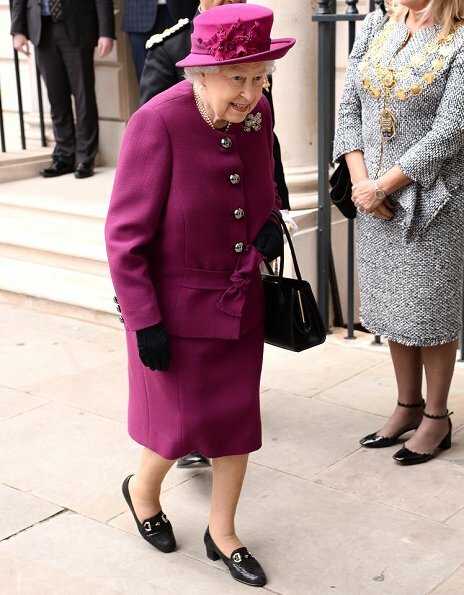 The Queen with some fashion accents of the season! The color, the big buttons, and the self fabric belt that ties in a knot. Its great to see her out and about.